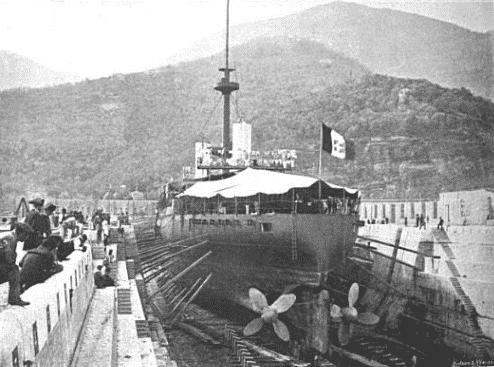 In 1883, the first two ships of this class, Re Umberto and Sicilia, were authorized in parliament by the Finance law. 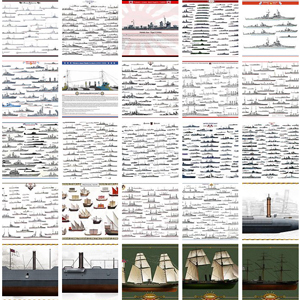 They had been designed by Benedetto Brin, then president of the naval projects committee. 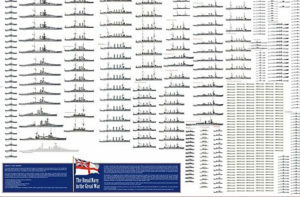 In 1885, the parliament also decided to vote for the construction of a third ship, the Sardegna, in order to create a complete squadron. 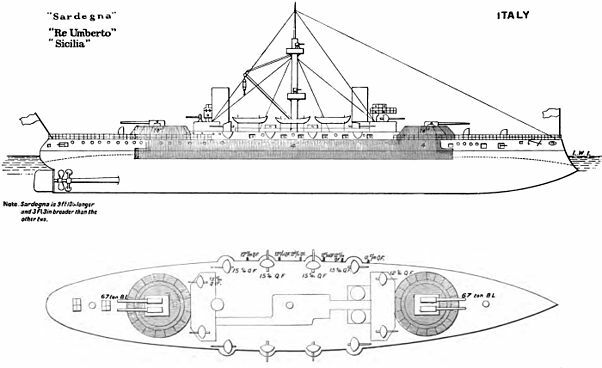 The Sardegna had for the first time, triple expansion engine and cylindrical boilers. She was heavier by nearly 1000 tons and larger by two meters. 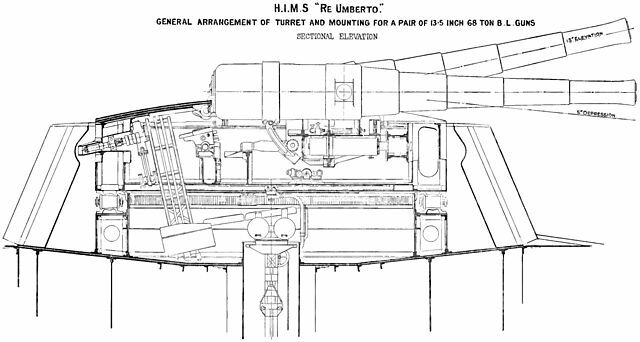 In common, they had several unique features: Three chimneys, two of them in tandem, raised barbette/turrets at the fore and aft, a relatively low caliber (343 mm against 430 on the previous Ruggero di Lauria) but fast-firing, at twice the speed of previous gun, with in addition the abandonment of the échelon disposition. The hull was therefore much longer, but stayed low. 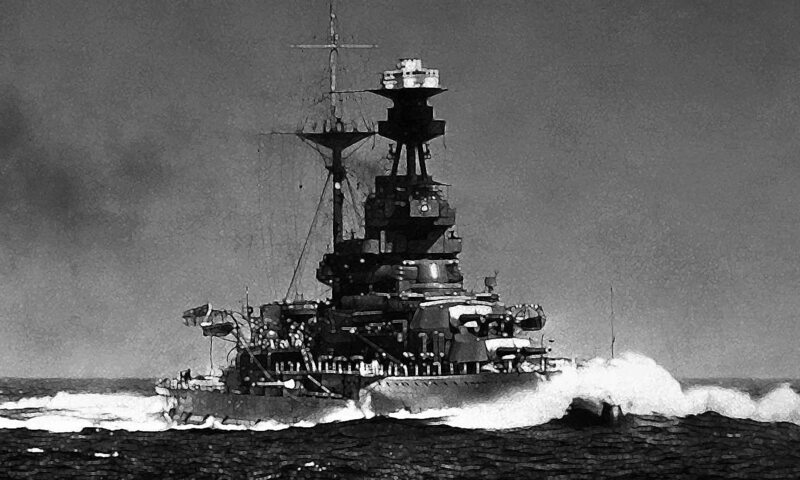 The Sardegna was also equipped for the first time with a Marconi wireless telegraphic station. 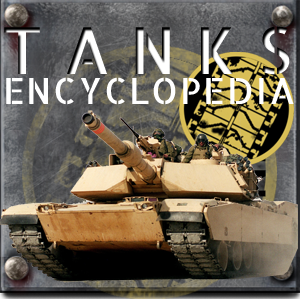 All three ships had very thin armor protection and high top speeds. Re Umberto served with the two others in the same active squadron for more than 10 years. By 1905 this squadron became the reserve squadron. 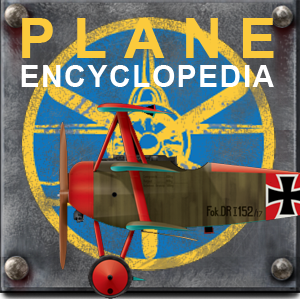 In fact they were used as training ships as the Italo-Turkish War erupted in 1911. In 1912, Re Umberto career was about to end. She was used as a floating tanker at anchor in Genoa. She was badly damaged in May 1914 and after repairs served as a supply vessel for La Spezia from June 1915. She was reactivated in December 1916, recommissioned and converted into a port defense battery at Brindisi and Valone. In 1918, she were once again converted for a final assault of Pola, and was to open the way through mines and nets like a bulldozer, followed by 40 MAS. She was totally disarmed except for eight shielded 76 mm gun, 240 mm Howitzers, but also turrets and bow blades. She was towed to Venice for the raid at the end of October, but the operation was canceled with the armistice and she was struck off in 1920. On her side the Sicilia was reformed in July 1914, but resumed service as a tanker at Taranto, and a Workshop until the end of the conflict. She was destroyed in 1923. 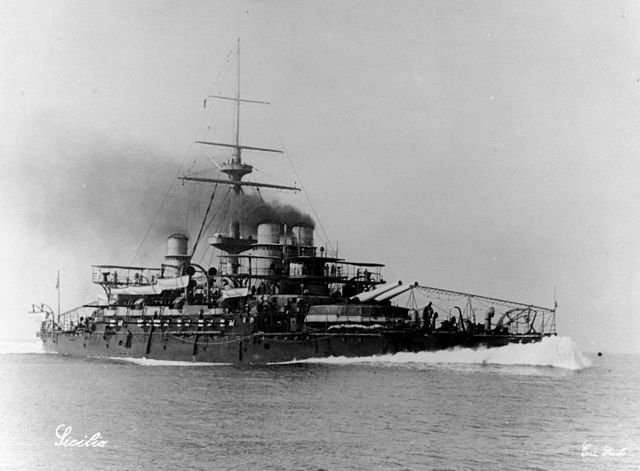 However Sardegna and Sicilia supported the Italian left flank and bombarded Tripoli on 23–26 October 1911. 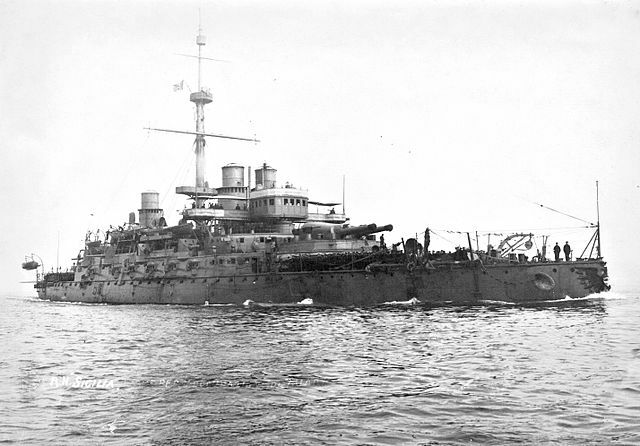 Sardegna was the flagship of the northern Adriatic fleet, based in Genoa until 15 November 1917, and was sent to Brindisi as a coastal battery, her secondary armament reduced to four 76 mm guns, and 3 heavy machine guns for AA defense. On 10 July 1918 she was transferred to Taranto and then left for Constantinople in 1919, where she remained until 1922. Sicilia was removed from the lists in 1923.